The Friends of Washington Market Park organizes free tennis clinics for children. Grouped by age, children receive instruction from tennis pro Eduardo Gill. The children participate in drills and games and learn the basics of the sport while having a great time! The clinics are free. No reservations are necessary — the first 20 children to arrive at the courts for each time slot will be able to participate. Please bring your own racket! Mandarin Seeds is hosting a FREE Chinese Playtime for our beloved TriBeCa families. 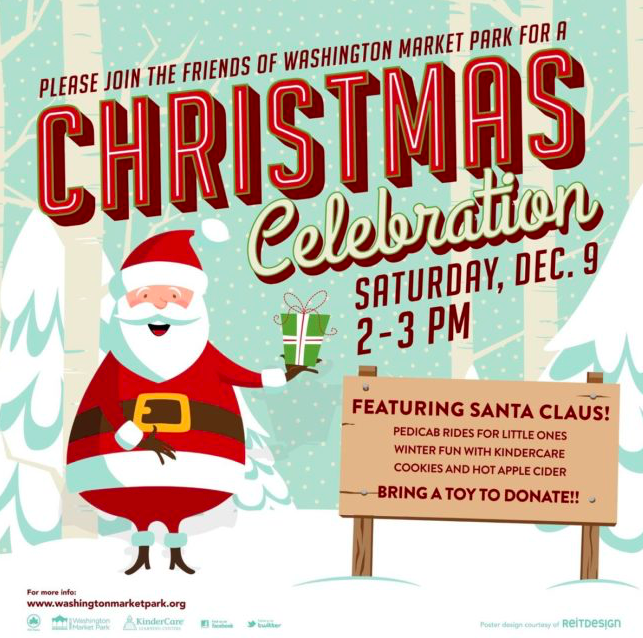 Come and join us this Saturday afternoon at Washington Market Park. Mandarin Seeds teachers will be doing some fun Chinese sing-along songs in the park! 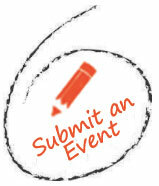 This is a FREE event designed for families with young children, ages 0y-3y. No RSVP required. Meet us on the lawn of Washington Market Park in Tribeca. Spots on our picnic mat are first-come-first-served. Arrive on-time to secure a spot for your family! This is not a drop-off event. 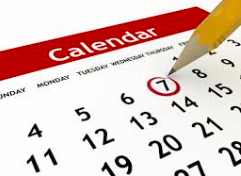 Please check our website or facebook page for the latest update. 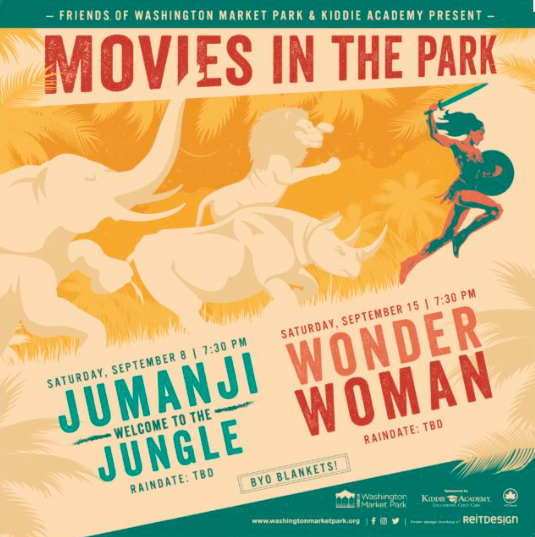 Movies in the Park returns to Washington Market Park and you are invited! Join neighborhood families on the lawn and don’t forget your snacks and picnic blankets! 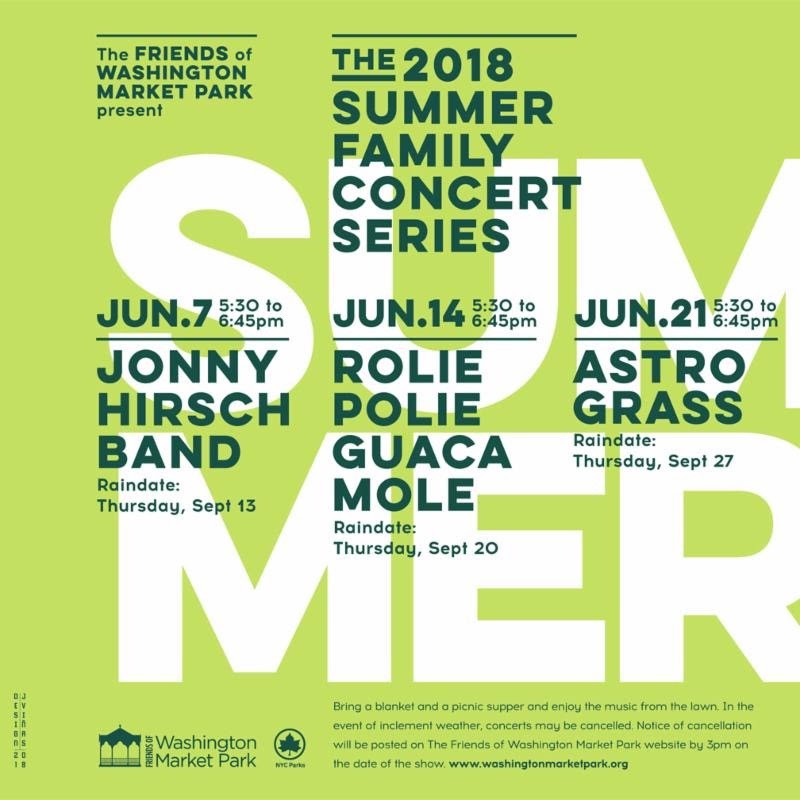 The last free concert from The Friends of Washington Market Park 2018 Summer family concert series is around the corner. This last performance will be by the band Astrograss. They are a bluegrass band formed in New York and entertaining for families. The best part is it’s free! Be sure to check out the final show in the concert series and enjoy a night of family fun.